When new patients visit Dental Solutions of Little Rock for the first time, they find that we aren’t like a typical dental practice. Every new patient visit is scheduled with one of our dentists, who get to know the patient on a personal level as well as discuss his or her needs with them. Upon gathering this information, our dentists are able to discuss their findings and patient concerns related to their smiles. If treatment is recommended, a customized care plan will be created and reviewed. Before you coming to your first appointment, we encourage you to download, print out, and fill in our new patient forms. Most of the time spent waiting for a new patient visit is due to filling out and processing paperwork. By making our forms available online, they can be filled out ahead of time and brought with you to your first visit. 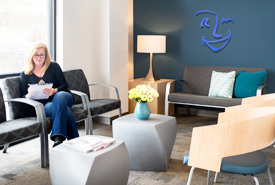 WiFi is available for our patients and their families to use when visiting our office. Televisions and headphones are included in each of our treatment rooms to help patients tune out the noises around them if they wish. Nitrous oxide is available upon request. After a visit, our patients enjoy being able to walk next door to pick up a coffee from Starbucks! Financing options are available to assist patients with care related expenses not covered by their insurance. You will always find a helpful hand at Dental Solutions of Little Rock. Our dentists are proud to personally respond to calls from patients regarding questions about their oral health. Contact us to become part of our practice family today!